Happy New Year! We are so pleased that we've made it safely and in God's arms here in Kenya to 2014. We continue to grow through the word of God, in our homeschooling endeavors and in ministry development at Living Water. We have some very exciting news to share! 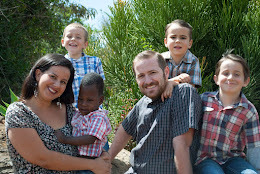 We are pleased to announce that on March 2nd, Living Water will have a new Senior Pastor, George Murigi! We are so pleased that after much prayer we are able to make this transition. We won't be going anywhere, though! Our plans are to stay at Living Water Christian and continue to develop various ministries within the church. We've got Children's Ministry up and running now we are working on getting a worship rotation in. Please keep us in prayer as we only want to move and develop as the Lord leads. We can hardly believe that we have been in Kenya for four years. Our visas will expire next month so we have applied for renewal visas and are hoping to get three years. We have some exciting new things the Lord has been leading us to. We can't wait to share them with you! We want to thank you all from the bottom of our hearts for praying for our family for 4 1/2 years out here, supporting us financially, sending us encouraging letters, notes, gifts. Your prayers, encouragement, faithfulness in support and the Lord's work is what keeps us out here. We always thank God for you!